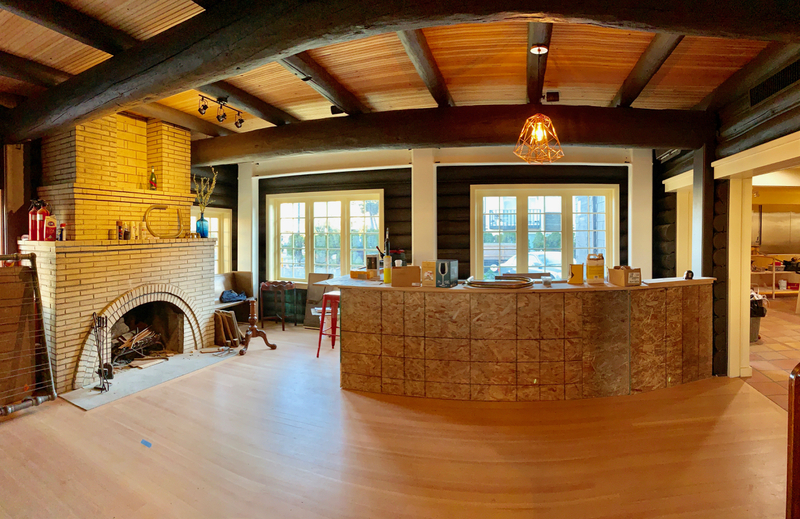 The bar area for Il Nido is still under construction in the Alki Homestead building but will offer seating for 8 at the bar, and an additional 10 or so in the area just adjacent. The bar itself will have a live edge wood top, and custom cut 4x4 ends at varying depths on the front to provide texture and visual interest. The Alki Homestead's new restaurant tenant, Il Nido is aiming for a "late Spring" opening said owner Mike Easton. Easton and his wife, Victoria Diaz Easton currently run Il Corvo at 217 James Street near Pioneer Square in downtown Seattle. The restoration and modification progress on the historic structure at 2717 61st Ave SW, originally built in 1904, has been meticulous and steady, with three apartments upstairs now occupied. The new restaurant will seat 64 people, with 8 bar seats and pew/bench style seats around the perimeter. Vertical grain fir floors are now installed, and while the massive original fireplace was not retained, a new handmade rock decorative version is in its place with a rough hewn log mantle. Additional seating for 20 will be available on the new outdoor patio in the rear. One ten foot long table will be in place and for larger parties any number of tables can be put together to accommodate big celebrations or gatherings. New concrete walkways and revamped landscaping with possible fencing will potentially allow seating out in front as well. "We're definitely getting it licensed so the bar can overflow a little bit on to the front porch. In the summer if we decide we have the need, we could absolutely have people out on the lawn," Easton said. "The restaurant design itself incorporates functionality," said Easton, "not only making it a restaurant that is easy to work in but works well." One of the design features in Il Nivo will be a "Wine Wall" that visitors will see at the back upon entry. "It will functionally be for the servers but it will also be a beautiful wine rack that adds to what you see as you enter." It's too soon to talk about the menu offerings he said, "But I've been cooking Italian food long enough that I know what directions I want to go." Easton said the famous Homestead fried chicken will not be on the menu, even though he acknowledges that it's the most frequent question he gets. "I just have to tell people we're going to do fantastic Italian food and there will be something for everybody but there won't be fried chicken." Il Nido will "absolutely be available for wedding rentals, to rent the whole space out," Easton said. "Of course they will have to book that many months in advance." That front lawn I can picture an arbor and we can fill that lawn with chairs. You could have a nice 100 person wedding there no problem." Easton said he's planning on doing wine events, and possibly some portfolio tastings for certain importers. He said he has connections in the coffee industry and might be doing some cupping events as well. It will be open for brunch and dinner. Wow. Although it’s beautiful, it looks nothing like the Homestead I grew up with. Why did they take out the amazing, original rock fireplace? This is sad, to me. Doris Nelson would be mortified. The original fireplace was too damaged to repair. The settling of the building and the venting through the upstairs apartments was no longer able to made to fit the building code. So they built a replica that is decorative. It too is handbuilt from the brick firebox to the rock exterior and the rustic log mantel. The other fireplace is operational. I had my wedding reception here back in 1987! I have a photo on the front porch when it was the Alki Homestead. It was beautiful then, and looks like it will be beautiful again. Would love to have a small wedding reception for my daughter's wedding sometime in late Spring....any reservations yet? It looks so beautiful !!! What a lot of work! Please let me know!! In response to Doris being mortified, knowing Doris for many years she would be happy that the Homestead was at least partially restored after the fire, maybe not quite to her decorating tastes but definitely to her high standards of quality craftsmanship. It is nice to see that it is being cared for after many years of abuse and neglect. I do not like change and would have loved to have the it be the way it used to be but Doris is gone and the Homestead lives on.